The high performance blender market began only a couple of decades ago, and the Ninja blenders have leaped to the top of the pile of mid priced brands with their versatility, power and overall usability. This is not some blender that just has some mixing blades spinning around, the Nutri Ninja Blender Duo with Auto-iQ Model BL641 is a beast that can do things and tasks that most others only dream of. In this age of digital, even blenders are becoming totally electronic, and the Nutri Ninja is no exception. 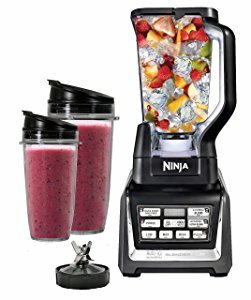 Gone are the manual little switches and toggles that every blender used to have, replaced by a digital access pad that, with the touch of a button, allows you to access all of the functions that the Ninja has to offer. The pad is even water resistant, so a little spillage or moisture isn’t going to matter and it is easy to damp-wipe clean after every use too. The Nutri Ninja Auto iQ does everything a regular Ninja blender does and adds a few unique touches for a modern world. It is a good choice for beginners as well as experienced blender users because the Auto iQ presets are good for the former, while the manual control buttons are good for the latter. It comes with a 72 ounce total crushing jar and two smoothie making container travel cups that come with a shared mixing blades set cover, so you can smoothie or juice virtually anything that fits in them. The jar is the one that will handle ice because of its stacked blades. Once done, you can either pour out the contents from the jar or you can replace the blade cover on the travel cups with the included Sip & Seal Lids and take the containers with you to work or the gym to drink directly from. That gives it more versatility than many of the other blenders in this category, truly making this a blender’s blender that is really hard to beat, whether you are mixing smoothies or cocktails, pureeing for soups or dips, or making milk shakes. The Auto iQ functions actually control the speed of the blender and the time the mix is blended. For example, let’s say you want to mix up some carrot juice. Put your ingredients into either the 72 ounce jar or one of the serving cups, either the personal 24 ounce size or the big multi-serve 32 ouncer. Screw on the blades for a serving cup and lock it into the Ninja base or screw and lock the blending jar into the base. Hit the Nutri Ninja Ultra Blend button and the blender will run for a programmed amount of time. It will pulse, it will speed up, slow down and stop when the time is up. At that moment, you will technically have the perfectly blended juice that you can imagine. Because the Nutri Ninja can do so many things, you’ll have to thoroughly read the instruction manual. This is not a one-button blender and it may take several uses before you get comfortable with the operation. That being said, the iQ presets do give you 1 button ease, but they can only be used for certain tasks. For example, two of the presets won’t work with the pitcher, you’ll have to use the included Nutri Ninja serving cups, while one of the presets won’t work with the cups, it will only work with the pitcher. The base unit has two concentric rings to mount the jar and travel cups on. The larger one is for the jar. With this design, the base knows which type of container has been mounted on and enables only the right buttons. However, you can also use the manual control buttons, low, medium, high and pulse, and forgo the presets entirely, which is where this blender shines because beginners can use the presets while experts can have more control with the manual buttons. Water resistant front panel for ease of cleaning. Locking pitcher and serving cups for maximum safety. Big buttons and printing so virtually anyone can see them. An ice crushing machine unlike any others. The serving cups come with their own sip and seal screw on lids for secure portability and easy sipping. Heavy duty pitcher handle makes it easy to lift. The square pitcher design creates a vortex inside that mixes everything thoroughly. Lighted control panel with small LED screen to show time and speed. You also get a recipe book that breaks recipes down into different wellness categories as well as sugar content of the fruits and vegetables used. You can find a recipe for smoothies, juices, milkshakes, soups, dips, sauces, batters and more. Sure, you can just press the manual low/medium/high buttons and mix or grind whatever you need, but if you want to explore everything the Nutri Ninja can do, you’ll have to read, learn and understand the functions in the instruction manual. This blender can be complicated to use and although extremely competent in every way, this type of complexity might be overkill for someone who just wants to make a smoothie now and again. Simple to use in manual use mode. Good for families and well as those who like to make one or two servings to go. This may be the best ice crusher ever made in the mid-priced bracket. Turns ice into powder within seconds! 1300 watts of power means the machine will never bog down under any circumstance. Ninjas are known to be very reliable. All accessories are BPA free and dishwasher safe. Locking lids keep everything in place when you turn it on or off. Suction cup legs keep it firmly in place on any smooth surface. Complicated to use in the Auto iQ mode. You’ll need to read the instructions. The pitcher handle must be facing to the sides or it won’t lock into place. Very loud and noisy! Cover your ears when you grind ice. Big, bulky and heavy. Set it on your counter and don’t expect to move it around. The vertically stacked Ninja blades are very sharp! Be careful when removing them for cleaning. The reality is this. The Nutri Ninja is not the right blender for everyone. Yes, it can be easy to use, but the Auto iQ features mean that to get the most out of this unit, you’ll have to really read and learn the instructions and use it for making other things as well, like soups, dips, etc. Now is that a bad thing? Hardly, but if all you want to do is to make smoothies, there are really other choices available that won’t cost as much money and that are far easier to use. If you’re looking for a top of the line blender and you have deeper pockets, go with a Blendtec or Vitamix instead. If you love to grind ice completely and you don’t want to spend more than about $200, you just cannot go wrong with this Ninja. You can see in the video above how stunningly effective it is as it literally pulverizes ice, and if that is a priority in your life, then this is a “must have” blender. Just remember to get a good pair of earplugs when you do.